Saskatoon, SK, May 26, 2016 – The culinary team at SilverBirch Hotels & Resort’s Radisson Hotel Saskatoon continues to earn accolades, the latest coming at the recent Canadian Culinary Federation (CCFCC) Conference in Windsor, Ontario. Michael Weckworth, a chef de partie at Radisson Hotel Saskatoon’s AROMA Resto Bar, won a silver medal in the CCFCC Senior Culinary Competition. He impressed the judges with two dishes: a lemon and beet cured trout, lemon grass mussels, asparagus tips, butternut purée, butter braised leeks, crispy fingerlings, pickled beet, and beurre blanc sauce; and a chimichurri flank steak, leek ash goat cheese, roast tomato sauce, asparagus purée, fennel, cubed butternut, pickled onion pedals, and paprika lentil crumble. Michael earned the right to represent Saskatchewan in his category after winning the CCFCC Senior Culinary Competition in March. Brooklyn Lusignan-Beauchamp, a culinary student at Saskatchewan Polytechnic and a cook at Radisson Hotel Saskatoon’s AROMA Resto Bar, represented the province in her category at the conference after winning the CCFCC Saputo Junior Culinary Competition in March. She prepared three dishes: an appetizer consisting of caramelized green apple and brie tortellini with chardonnay cream, shallot compote and almond crumb, served with white asparagus nasturtium salad; an entrée that featured cheddar soufflé with baby fennel, braised leek, kale, butternut squash puree, and pickled hon shimeji mushroom; and for dessert, ricotta Bavarian and ricotta beignets accompanied by balsamic cherries, lemon curd, oat and hazelnut crumble, honeycomb, and wild berry gel. The two were accompanied by Radisson Hotel Saskatoon’s award winning Executive Sous Chef, Chris Corkum, who is the representative for Canada at the Global Culinary Challenge in Thessaloniki Greece in September 2016. Chef Chris cooked courses at the CCFCC President’s Ball on the final day of the convention. For this honour, he was awarded a cheque for $5,000 towards his training and trip to Thessaloniki. In addition, Radisson Hotel Saskatoon’s award winning Executive Chef, Scott Torgerson was recognized at the conference for the team’s contributions to the culinary arts in our country and on the world stage. 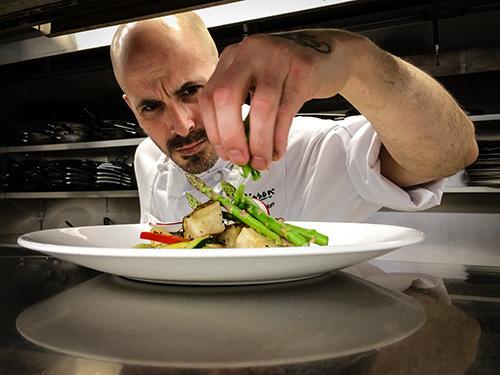 He is coach and mentor to Chef Chris, Michael and Brooklyn, and is also the newest member of Culinary Team Canada, which will be representing the country at the Internationale Kochkunst Ausstellung (IKA) Culinary Olympics in Erfurt, Germany, in October 2016. The Radisson Hotel Saskatoon in Saskatchewan is a modern hotel featuring contemporary design and intuitive services. Located downtown the hotel offers breathtaking views of the South Saskatchewan River Valley and City Center. With 291 rooms and 19 floors, the Radisson Hotel Saskatoon boasts superior comforts, including high-speed Internet access, an indoor water park, on-site meeting and dining space and more. The Radisson Hotel Saskatoon has been awarded with a 4 Green Key Eco-Rating and a 3 Green Key Meeting Rating under the prestigious international Green Key Program, an Eco-Rating program which recognizes environmental performances in hotel industry.